being woken at 06.00 to the sound of "Sonne" by German heavy rockers, Rammstein blasting out across the hotel. Only of course it wasn’t 06.00 as remember we were on “Rally Time” or to put it another way “the German organisers are too lazy to change their watches time”. For those of us still operating on Greenwich Mean Time (including the rest of Morocco) it was of course still only 05.00!!! And no, I don't have a clue what the video is all about! Today was to be my first taste of proper dunes! In the Moto amateurs we had to do one large lap that turned out to be about 70km and then a shorter lap of around 30km. When we got fuel last night I had filled the 5 litre rear tank and this morning put about 8 litres in the main tank, to give me a “normal” fuel load but with a rearward weight bias. The bike was running well except for the leaking fork seal! I had enquired if Torque Racing could replace it but they only had one set of seals and obviously wanted to keep them in case one of their clients needed them. Donna suggested making a cleaning tool out of a plastic bottle as it might just be grit in the seal. We had done this and it seemed to improve things, well the oil didn't seem to be leaking out so fast, so an improvement I guess! I set off and was soon struggling, although I knew the theory for riding dunes, putting it into practice was a bit more difficult. It didn’t help that these were relatively small dunes which everyone says are hardest to ride and I wasn’t going to disagree with them! The sand was also very soft. It was also extremely hot and I was starting to regret my decision to wear a jacket. A lot of competitors were only wearing motocross shirts on the rally but I chose to wear a rally jacket. The theory behind my decision is that a shirt appears cooler especially at slow speed but as you go faster the wind strips away the moisture that you are sweating, so you are constantly loosing fluids that you must replace. A jacket on the other hand keeps the breeze away from your skin and allows the sweat to condense inside the jacket, so you are losing less fluid and ultimately you stay cooler. Well as you might guess it does make for a rather sweaty, stinky environment but I guess you'd be just as sweaty in a shirt and overall I have to say, the theory seemed to work. After only short bursts of higher speed I definitely felt more comfortable as my temperature seemed to be fairly well regulated. The discomfort when stationary or moving slowly (or picking the bike up... again)! seemed a small price to pay. The other advantages of course are that you have pockets in a jacket for carrying all manner of bits and pieces, phone, money, first aid kit, food for the day and it all remains easily accessible. And of course there is the obvious benefit of added protection if it does all go wrong. Meanwhile out in the dunes, a couple of secret checkpoints were easy to spot and I started to make progress, eventually leaving the dunes into a more stony area. At this point the lead cars in the Car Amateurs, started to catch us and three passed me. Just after a British registered Bowler Tomcat came past, their only spare wheel came bouncing out the back. They were obviously unaware so I remembered the distance it had happened and I set off in pursuit, riding through their dust was not a lot of fun but I eventually drew alongside and flagged them down, although we had travelled another 8 km by then. I was able to tell them about the wheel and the fact that their high lift jack was also about to part company with the car. They thanked me and headed back to try and find it. Some fast, stony pistes followed, then skirting round a small village we headed into the dunes proper, these were huge! I soon got into the swing of things, realising that riding on virgin sand, rather than in the wheel tracks of others was so much easier and taking regular stops on top of dunes to scout the way ahead seemed to pay off. Of course this was also interspersed with (very) regular stops when the front wheel washed out in soft stand, the back wheel decided to bury itself, I stalled in soft stand or when trying to climb steep dunes or I just fell off! A consequence of this was that the bike was getting very hot and the fan was running constantly and of course every time the engine was off, it was drawing from the battery and this combined with frequent restarts meant it was soon flat. This meant resorting to the kickstart, which in itself is not an issue as it often started first kick but I was not always in a good place to kick the bike over, on steep slopes for instance and to kick start it, the bike has to be in neutral which as it got hotter became more and more elusive! This was very frustrating but I soon developed a technique of stopping and picking the bike up (when required, which was often), taking off gloves, helmet and goggles, having a drink and letting the bike cool down (and sometimes taking a few photos). Once the bike was cooler, I’d select neutral, start the bike and get my gear back on before starting again. This of course was eating heavily into my time but seemed the only logical way forward. To be honest if my technique was better, I wouldn’t have had to stop so much and the battery would have been preserved. Also because I was travelling at relatively slow speeds and stopping a lot, the battery never got a chance to recharge. At one point I found the Bowler crew taking a breather, so stopped to chat. They never did find their spare wheel and hadn’t heard me tell them about their high lift jack, so they ended up losing that too! Mind you they still seemed to be in good spirits! Soon after I was riding in a remote area of dunes when I just stopped dead! I narrowly managed not to go straight over the bars as the front wheel had just sunk to the front axle. I took the opportunity to have a breather and take a few photos. The scenery was truly stunning, with dunes stretching off in all directions and it felt really remote. I could only see one other competitor and he soon disappeared over the horizon. A bit further on and the GPS track took me around the shoulder of a huge dune with a small Berber encampment at the base. Trying to climb the slope, I didn’t manage enough speed and stalled near the top, after burying the back wheel. 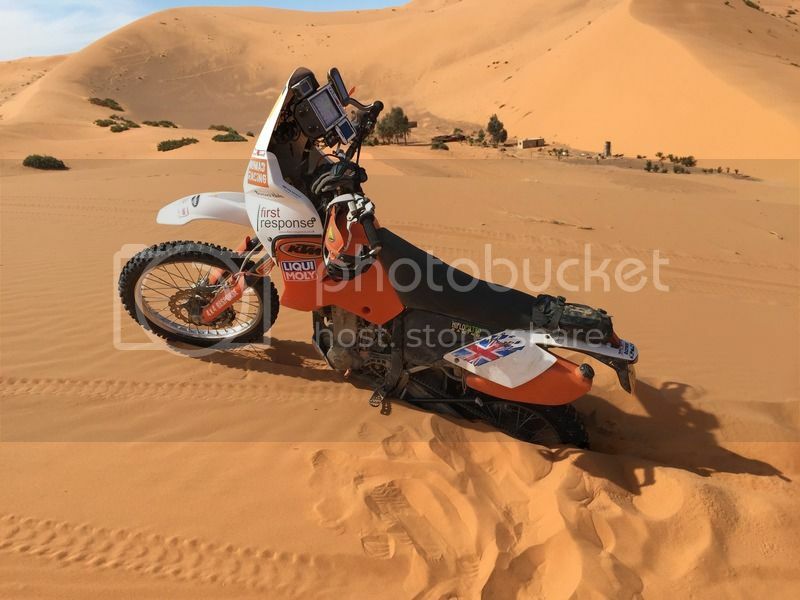 The technique in these situations is to lay the bike on it’s side, drag the back wheel sideways out of the the hole you have just made and then pick it up again and pull away on the clear sand it is now sitting on. In this case it also meant manhandling the bike through 180 deg. so I could head down the slope and have another go. Whilst this was going on, two young lads appeared from the encampment and offered various “suggestions” in French! The bike was almost impossible to kick over on the steep slope, so I got them to stand each side and hold the bike upright whilst I stood on the footpegs and got a decent swing on the kickstarter. The bike started easily and I let out the clutch and shot off down the slope with a shouted “merci bien” to the lads. Whilst doing this I had spotted an easier route around the dune so headed off that way. This lead me into a flatter area, with a wide sandy piste, still tricky to ride but easy compared to the dunes. This led me straight to a checkpoint, where I was able to stock up on water as I had drained my camelback and was already using my 2 litre emergency reserve. The temperatures were well into the thirties by now which made it very hard going. Suitably replenished, I headed off back into the dunes, starting small again but getting progressively larger as we were actually on a figure of eight loop rather than a circular lap. Most of the road book instructions were just “follow the GPS” so I was a bit concerned when the GPS started playing up and the touch screen wouldn’t respond and I was forced to turn it off and on to “reboot” it. I was fairly convinced it was the heat that was doing it, so there was little I could do. The route was however fairly obvious, especially as some of the pro competitors were now on their third lap and were passing me, so it was quite busy. Dropping into a large bowl between dunes, I again failed to get up the slope, bogging down just a metre or so before the top. The technique is to use speed to climb the slope but rolling off the throttle as you get to the top, so you almost come to a halt with your front wheel just off the edge. The dunes form in wave shapes, so you get a convex back slope but the other side starts vertical. So if you carry too much speed, you’ll just launch off the top, often with disastrous consequences. Instead you drop off slowly and give a burst of throttle in second gear as you power down the slope. Well that’s the theory but it’s very difficult in practice to judge it right and by now, just after noon, the sun was vertical in the sky and the complete absence of shadows makes it very difficult to judge where the edge is. Also as the day wears on, any overnight moisture in the sand is gone and it just gets progressively softer. The back slope beyond this dune was particularly high and completely vertical for a couple of metres at the top, so a fairly scary prospect. I dug the wheel out, turned the bike round and coasted down to a firm section at the bottom of the bowl. Although I was able to get the bike into neutral, I just wouldn’t start. It was starting to feel quite lonely as I had no vision out of the bowl, although I could still hear engines around me. It was at this point my saviour appeared, in the shape of Italian photographer Giorgio! He came striding over the dunes, barefoot and carrying just a small rucsac, his trainers and a camera and gigantic lens! It turned out that he and another photographer had driven into the dunes in their 4x4 to catch some of the action. He had seen me disappear into the bowl but not reappear so came to investigate. We tried kick starting the bike with him holding it up but it just didn’t want to start. Giorgio held his hand over the exhaust exit and pronounced “no fuel”. At this time I was running on the rear tank, so we pulled the side panel off, to find the fuel tap had moved just enough to block the flow. A cable tie soon secured it in the fully open position and the bike started after a few kicks. I looped round the bowl and fired it up the slope again only to repeat my previous failure, this time Giorgio helped me to turn the bike round. On my third attempt I used more gas, held off slowing until the last second and gave the bike a handful of gas as I plummeted off the edge…. textbook technique! What followed was a seemingly endless series of dunes, as we crossed over our previous track, although I only new this from the GPS display of my route so far. I was repeatedly bogging down either the front or back wheel, losing the front end in the soft sand or stalling. This of course was followed by increasing long periods of getting the bike started again and I was getting seriously fatigued and needing lots of water. I once again emptied my camelback so stopped and refilled it using my 2 litres of “emergency” water, guessing this would be enough to get to the next checkpoint which was only 5 km away where I could top up my supplies. This was going fairly well and despite my fatigue, when riding I was getting the technique right and stopping less, although I did still have the occasional stops and subsequent battles to find neutral! 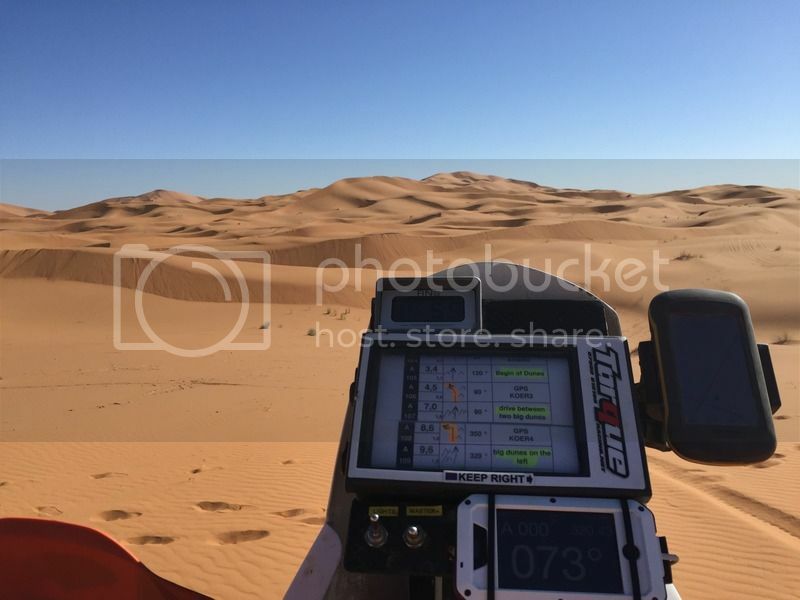 The roadbook had the instruction “head towards Kasbah (hotel) on horizon” I eventually spotted it in the distance and knew this is where the next checkpoint was and that I was now less than 3km away. However shortly afterwards I bogged down on top of a dune and as hard as I tried I just didn’t have the strength to drag the bike out. I decided to have a decent rest before trying again, so stripped off my helmet, rucsac, jacket and body armour and had a good long drink. I realised I needed to pee, which I took as a good sign that I was keeping adequately hydrated but when I took another drink, I discovered all my water had gone. I had drunk 4 litres since the last checkpoint and two of those in only 2km! I was also getting low on fuel and although I knew John was waiting with fuel at the start of the (shorter) second lap, I still had to get there. This was starting to get a bit worrying, as there was no sign of any other competitors and although there was a Berber tent off in the distance, it appeared deserted and it was a very long walk there and back even if I could find some help. So I started to think I might have to wait to be rescued by the organisers. There was no phone signal so I couldn’t phone in either. It was at this point I told myself to stop having defeatist thoughts and sort myself out, when at the same time I heard a bike approaching. It turned out to be fellow Brit Hugh McKay, who quickly helped me extricate my bike and get it started before heading on his way. I gratefully got kitted up again and set a GPS track directly for the checkpoint and headed off, I only stopped a couple of times after that but those 3km seemed to last an eternity. Arriving at the checkpoint on the edge of the dunes, I was informed that I was out of time, so couldn’t continue, I think they were rather surprised when I thanked them! The format of the Tuareg meant that I could start the next day but would have to take the time of the last rider to complete the stage plus a penalty. Another British rider Lawrence Barber was at the checkpoint and he too was pulling out for the day having injured his ankle. One of the organisation doctors, got us both in the shade of her car, made us drink lots of water, apple juice and a sachet of magnesium salts, which certainly made me feel better. 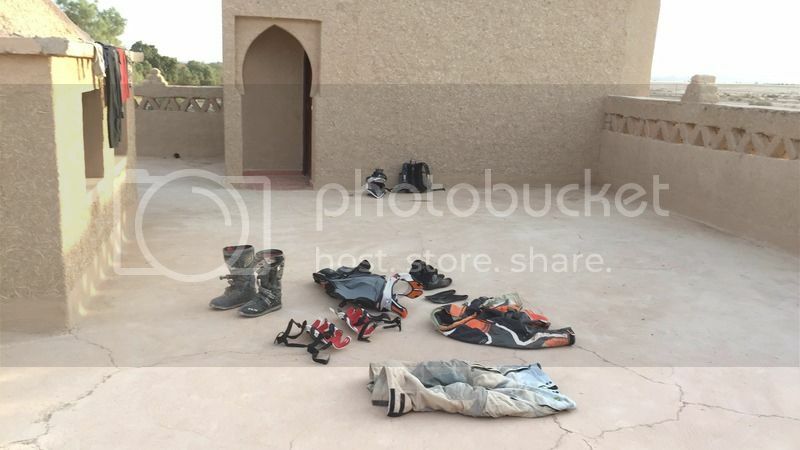 After a rest we headed off back to Merzouga, with Lawrence agreeing to ride with me in case I ran out of fuel. In the event I had plenty and we rolled into the final check to hand in our timecards before riding the short distance to the hotel. I headed straight up to the room and had another cold shower (not through choice, the solar powered hot water system was sadly lacking)! and took the opportunity to wash a load of kit in the shower, making use of the sun soaked roof to get everything dry. A long hard day but I wasn’t disappointed in having it cut short as my ambition all along was to just finish the week and I was still on track for that. More amazing was the fact that my stage result that day in the combined amateurs was only one place lower than the previous day at 30th. I was also still 4th overall in the over 50s category, so not too bad at all!